If you’ve ever enjoyed a Cherokee Purple tomato, Meyer lemon, Gravenstein apple, or Elephant Heart plum, you have a whole lineage of farmers and gardeners to thank. These heirloom varieties have been patiently nurtured, selected, and passed on from generation to generation—the original open-source food. In contrast to hybrid and genetically modified varieties, heirloom plants are open-pollinated through wind, insects, or birds. Heirlooms breed true to their parent plant and seeds can be saved and replanted indefinitely. Also, heirloom cultivars contain more genetic variation than hybrids, allowing farmers to save the select and cultivate the seeds of the plants that are best adapted to their growing conditions and climate. Next week, you can explore the wide world of heirlooms at the Third Annual National Heirloom Exposition at the Sonoma County Fairgrounds. With a full line up of workshops, cooking demonstrations, exhibits, and educational speakers, the three-day expo is a kind of Disneyland for home gardeners, organic farmers, food activists, and eaters of all stripes and ages. 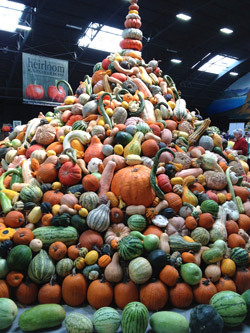 Where else can you marvel at 3,000+ plant varieties and livestock breeds, see Dr. Vandana Shiva speak, pet an Angora goat, and have your photo taken in front a 12-foot tower of heirloom winter squash? We talked with Paul Wallace, organizer and co-founder of the nonprofit expo (with Jere Gettle, owner of Baker Creek Heirloom Seeds), to find out more about the expo. When Paul is not busy planning the big event, he manages the Petaluma Seed Bank, housed in the former Sonoma County National Bank building. CUESA: What was your inspiration for the Heirloom Expo? As the event got closer, we added educational speakers, a poultry and livestock show, and a giant pumpkin contest. It was really like an old-fashioned county fair without the rides, and with an emphasis on education. In that very first year, we had over 75 educational speakers, and about 10,000 people came, including 600 school kids who were bussed in for fun and educational activities. The funds that were generated above our costs were donated back to the schools that participated. In the second year, about 15,000 people came and 1,500 school kids. This year we have no idea how many people to expect! CUESA: How do you explain heirloom plants and heritage animal breeds to people who are unfamiliar with them? PW: The terms “heirloom” and “heritage” are akin to “antique” in the furniture world. It’s something that’s handed down from generation to generation because it has qualities that people deemed worth saving. Some people say an heirloom must be at least 50 years old, some people say 100. If produce varieties are intentionally crossed or hybridized in the field, and you save that resulting variety and continually breed it until it breeds true, that could be deemed an heirloom. When you save the seed, you will get exactly what you initially grew out. If you go to the store and buy a packetof hybrid seed and you grow it out, your produce may be exceptional, but when you save that seed, it may not be true to the variety you initially planted. 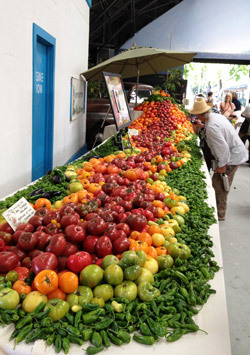 CUESA: Why are heirlooms worth protecting and celebrating? PW: You can tell by my accent that I’m Irish, right? A prime example for me is the Potato Famine in Ireland, which was as a result of mostly one variety of potato being grown. When that potato got hit by blight, it wiped out the potato supply in the whole country. If we get to a point where all of our corn, soy, and canola are genetically modified and there’s a problem, our food supply could be wiped out. That’s why it’s important to maintain and promote diversity. Every year, the biggest challenge for us in the heirloom seed business is getting a supply of corn when over 90% of the corn in the country is genetically modified. If a farmer grows non-GM corn and a neighboring farmer is growing GM corn, the first farmer could have his crops contaminated through wind pollination. It’s getting more difficult to find non-GM corn that breeds true and is not contaminated. And that’s just one crop. Here at the seed bank, we have 1,500 varieties of crops, and our intent is to grow that diversity. If you minimize the diversity, you leave yourself open for a potato famine. CUESA: The Heirloom Expo has also been called a “Pure Food Fair.” It sounds like there’s a bigger mission than just promoting heirloom varieties. PW: If you look at the youth now, obesity and diabetes have never been more prevalent, and we believe it’s a result of the foods we’re consuming. There’s a massive disconnect with the general consumer as to where food comes from. That’s the main reason we try to involve as many school groups as possible. I heard a story recently from a food historian who was conducting a study with a group of school kids in New York. He asked to come up with a collective answer for the question, “Where does pizza come from?” They got together, and after 10 minutes they said, “The telephone.” We have a lot of work to do to break down that disconnect. Children are the future of the food industry. To see more of them growing food in school gardens would be really great. CUESA: What are you looking forward to at this year’s expo? PW: This year, there are over 100 educational speakers, including Dr. Vandana Shiva, Patrick Holden (Sustainable Food Trust), and others. Having international speakers helps reinforce the message that this is really a global issue. Buying local and knowing your farmer is absolutely important, but there’s more to the picture. It’s the educational aspect for me, seeing people absorbing what the speakers have to say, and all those school kids coming in. We’ve introduced games like the Heirloom Olympics, where kids complete educational tasks such as talking to farmers and exhibitors or attending a seed saving class, and they get a prize at the end of the day. That to me is one of the more rewarding things—seeing people having fun and learning at the same time. The Heirloom Expo takes place September 10 through 12 at the Sonoma County Fairgrounds, 11 am to 8 pm ($10 for adults; free for children under 17). Learn more. 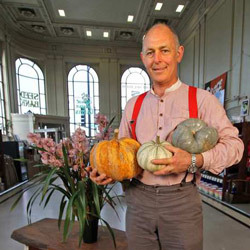 Photo of Paul Wallace from the Petaluma Seed Bank.